Elizabeth Dixon’s career within the Police Force was cut short in 1986 when she was involved in a car crash whilst on duty. 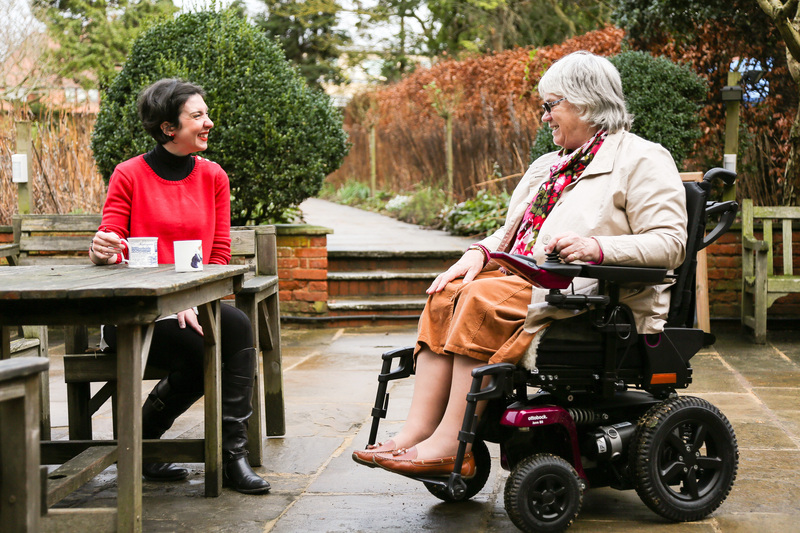 With the help of a series of wheelchairs, including the Ottobock Juvo B5, Elizabeth has become a prominent voice in her local area of Stratford-upon-Avon. Originally from Birmingham, Elizabeth enjoyed an interesting and active role within the West Midlands Police as the Force and the country’s first female dog handler. After her dog, Czar, retired, Elizabeth worked at Digbeth Police Station. It was during her time here that she was involved in a serious road traffic accident which resulted in life-changing injuries, including devastating damage to her spine. Elizabeth never returned to work after the accident, which took place when she was just 39, and ever since, she has received support from the Police Dependants’ Trust and the West Midlands Police Benevolent Fund. In the initial months after her accident and hospital treatment Elizabeth couldn’t return to her flat, which was located on the second floor, and had to return to live with her parents. She later was able to purchase a house which had a stair lift to help her get around, before moving into a bungalow. She bought an apartment in the historic town of Stratford Upon Avon 17 years ago, which is still her home today. Elizabeth’s accident left her tetraplegic and whilst she initially relied on manual wheelchairs, she later turned to powered wheelchairs for the comfort and functionality that she needed. Fuelled by the same determined spirit that led her to success in the police force, Elizabeth has become an influential figure in Stratford-upon-Avon since her move to the town. “I’m spread thinly like treacle” she laughs, describing the multitude of roles that she undertakes on a voluntary basis. She has helped improve the daily lives of countless others as a disability advisor. “I’ve done a mass of things over the years. I’ve worked with tourism boards at a national level as well as locally in Warwickshire. From all the years that I have had a disability, I have gained a great deal of awareness that I want to share with these organisations.” She’s passionate about ensuring that the town is inclusive and accessible to everybody who wishes to experience its unique attractions. She has influenced the decision-making of bodies that include her town’s shopmobility scheme, local councils, the Royal Shakespeare Company and the Shakespeare Birthplace Trust which cares for five of the most important sites related to the famous writer. In addition she is a governor for the West Midlands Ambulance Service; “that’s a role I really enjoy because of my background in the emergency services,” she says. Another one of Elizabeth’s achievements is producing an access guide for her town which provides up-to-date information for people with a wide range of disabilities who are looking to make the most of all Stratford upon Avon has to offer. It’s available online and in a printed version across locations in the town. “That’s something I have been really proud of. It has been supported by the Stratford Town Trust and it’s wonderful to see their enthusiasm in working on a project like this.” Looking back on the three decades since her accident, Elizabeth says, “I think a lot of people would say I have done well. I have remained independent and because I have worked hard for inclusion I know that I have made a difference to the lives of others.” As somebody who never gives up, though, she feels that her work isn’t finished just yet; “there’s always more that can be done to improve accessibility for people with disabilities” she says. Ottobock’s new Juvo range provides a winning combination of reliability, safety and design. The range is designed to give people with varying medical conditions and specific needs the opportunity to have their everyday companion truly tailored to them. Based on a special formula that a rehab specialist can personalise, giving each person a customised power wheelchair that is always ready to support a person’s daily routines and weekend activities. Previous ArticleActive Minds help people with dementia lead active lives.